In Restless, Sampath talks about his life and his encounters with the ‘Indian way of life’. The book takes an honest and hard look at the definition of success and happiness. V.R. Sampath leaves his comfort zone the moment it gets too comfortable. Now retired but still a seeker, Sampath’s life is governed by freedom and knowledge. He left a stress-free bank job to join the highly demanding Indian Police Service and then quit the police force at a very senior position to seek challenges in the corporate world. In the corporate world, he rubbed shoulders with the likes of Mukesh Ambani, Anil Ambani, G.M. Rao and Gautam Adani. If he had a close-up view of how political and administrative power worked during his police days, he got to know the world of money power during his stint in the biggest corporates in India. In Restless, Sampath talks about his life and his encounters with the ‘Indian way of life’. Through his varied experiences, he feels that India is in survival mode even after seventy years of independence. This struggle for survival has made Indians devoid of trust, compassion, and humanity, more often than not. Then, how does one survive? The book takes an honest and hard look at the definition of success and happiness. Sampath believes that people need to keep reinventing themselves constantly. That is the only way to keep the spirit alive. The book is worth reading, especially for those who feel that one should not be content with following a single trajectory. Here’s what Former NSA M K Narayanan has to say about the book: The life of a modern seeker, Sampath’s questing mind can be sensed through his professional life At the California Institute of Integral Studies (CIIS), his questions range freely across new fields of knowledge, in the search for value and meaning. “One discerns that it is in part a philosophical dissertation that helps bring out another side of the author’s personality”, Robert McDermott, president emeritus, professor, Department and Chair, Philosophy, Cosmology and Consciousness, CIIS. Leaving behind the mundane world of job security, which a government job offered, so also the challenging environment of the corporate sector, he ventures subsequently to seek inner solace and understand the true meaning of life. The second part of the book conveys an impression that the author was experimenting with life in more ways than one. Life needs to be lived to the fullest, and the mind, set free to follow its spirit of search and inquiry. To achieve what Sampath mentions as his basic philosophy in life, ‘tonnes of experience, an estate of consciousness and vast acres of mind’ is something all of us would wish for. 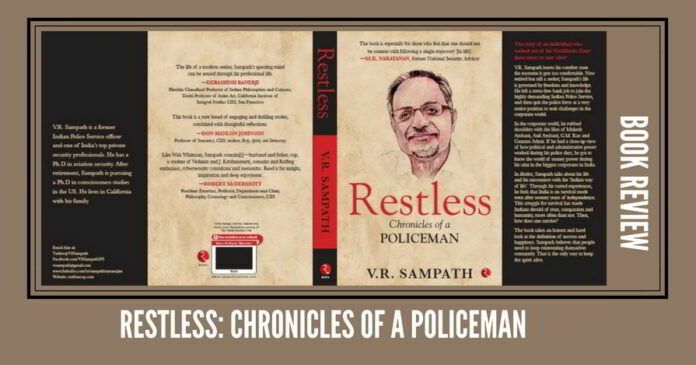 Memoir ‘Restless- Chronicles Of a Policeman’, is now available on Kindle! Previous articleKerala Floods – A Step by step guide on how the communist/regionalist forces politicize an issue by “framing an incident”. Next articleYour Honor, Urban Naxals were arrested not for showing ‘dissent’ but for hatching conspiracy to break India!